A recent phone call from Bob Patterson, a long time friend and birder, set me scanning the skies for 'swifts', well White-throated Needletails, to give them their proper name. It was a week or so ago, before the 'big blow', and on a day forecasting a thunderstorm. Bob had mentioned hundreds over his suburb of Blackman's Bay, but I only managed distant views of small numbers around the hills and over the Derwent River, from Bellerive. 'Swifts' seem to be far less frequently observed in the Hobart area these days, and I often spend time expectantly scanning the clouds during suitable weather conditions. By suitable weather, I'm referring to warm humid days, preceding storm fronts. Bob and I go way back, to arguably the heyday of the local birding scene ('70s and '80s), certainly as far as amateur scientific work is concerned. Today, quite rightly, the emphasis is more on conservation. I suspect, like me, he takes a somewhat jaundiced view of some of today's 'instant expert s', in a hurry to show their limited knowledge of the local birding scene! (Perhaps we were similarly perceived by the established birders when we first started). 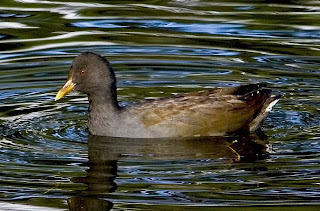 Bob also mentioned that on an old farm dam, close to the Antarctic Division's HQ at Kingston, he had seen some Dusky Moorhen and Australasian Grebe. Neither are these days considered to be rare in Tasmania, but certainly worthy of mention. 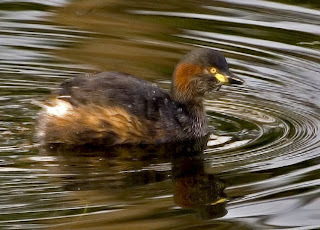 The grebe has always been a bit thin on the ground, most often found on farm dams, and was considered rare during the first Australian Bird Atlas (1977-1981). The first breeding record was in 1965, since when a slow increase has occurred. The similar, Hoary-headed Grebe, is widely recorded around the state. The Dusky Moorhen is a more recent 'invader', first recorded on Flinders Island in 1935, and present and breeding since the 1960s, on King Islan d. By 1977 it was recorded as breeding in the Launceston area (I can remember seeing them there then, on the surrounds of the then Launceston tip). From that time there has been a gradual southward range expansion. An early morning visit to Kingston found 4 Australasian Grebe, and a similar number of Dusky Moorhen, as well as a few Black Duck, and 2 Eurasian Coot, on the less than one hectare pond. Trying to get close enough for worthwhile images, particularly of the rather timid moorhens, proved difficult, almost to the point of total failure! The pond is fringed by reeds and protected by an impenetrable 'hedge' of Blackberry bushes, but eventually I 'scrambled' the accompanying images after several circuits of the dam. Watching the moorhens, there appeared to be 2 juveniles (one pictured at lower right), an adul t (top right), and an 'intermediate' plumaged bird (upper left). While compiling this piece, I've spent sometime looking at various images of moorhens, and the bird that I've described as "intermediate", still seems to be odd. It certainly seems to lack the white undertail feathers which is present even in the younger birds. I'm leaning towards the possibility that it is a hybrid cross between coot and moorhen, but with my limited recent acquaintance with Dusky Moorhen, I'm hesitant to be categoric! 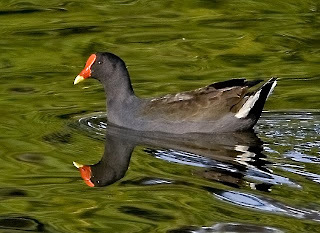 Certainly there are records of coot and moorhen hybridising in Europe, so that could be a possibility. It spends all its time with the other duskies, so it thinks it's a Dusky! Not sure whether such a cross has been recorded in Australia. It also fits with the possibility of it being a parent of the two younger birds. Probably of academic interest only, but I'd still like to hear from anyone having any thoughts on this. The Australasian Grebes were far easier to approach, but being much smaller, presented other issues. Although I've seen both of these species many times over the years, this was the first time I've managed to photograph them, so a 'thank you' to Bob! I don't have any experience with moorhen/coot hybrids, though the middle bird does look odd. We seldom see Moorhens around our neck of the woods, but then, Purple Swamphens aren't all that common round here, either. 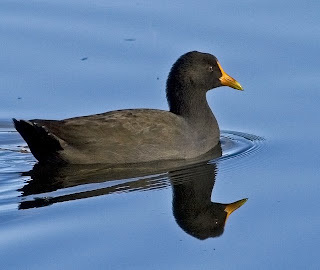 Most dams and waterways have an abundance of Coot and Native Hens. In fact, we are still looking to add Dusky Moorhen to our "parish list" It always seems strange to a mainlander like me NOT to see Duskies around our waterways often. I wonder if their population will suddenly 'explode' as seems to have happened with the Wood Duck enrty into the Tassie scene. thanks again for the blog! I was wondering if you could give directions to this particular dam, as I have yet to see a moorhen in Tassie . I agree with John, it's odd not to see them here, on the mainland I was used to seeing the three usual suspects together: coot, moorhen and swamphen. This dam is just short of the Antarctic Div HQ on the Channel Highway. It's on the left hand side of the road, just past the last houses, opposite a machinery business from memory. The site has large notices on it, advertising the forthcoming housing estate "Kingston Green". There's a large pile of debris in the middle of the paddock. The dam is lined by pine trees on the southern side of the pond. You can't see the pond from the road. It's usually safe to park just off the road there on the 'dirt'. Then walk about 50 metres or so, and voila! Well I hope so! E-mail if this isn't clear enough.